1. 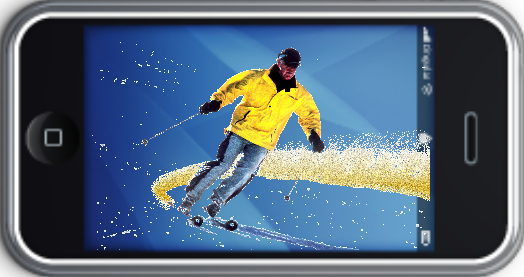 We spotlight skiing, including Telemark or Free Heel, and snowboarding in each lesson, rather than separate them. Each is an application on-snow, of shared universal concepts, so it's easy to apply. Then we layer knowledge, your lesson, upon those universal principles. 2. Building big to small, holistically, you are taught the things that can give you the most benefit first, usually in lower numbered lessons. From each, if you did nothing else but let your body flow from a centered stance, you could turn. So with a little information you can get a large benefit. Eventually, you'll come to a situation that could be enhanced with an exercise or understanding that spotlights additional technique. Then we address specific situations like bumps, powder, hard or icy surfaces, and speed control. Your success relies upon knowing where you are, and where you are going. The more advanced lessons typically require a heightened level of awareness of what you are already doing, more than a departure from the technique you've learned. We are not reinventing the body and its relationship to energy, we are harmonizing with it. But we may be reinventing the ski and snowboard lesson. 3. Icons and thumbnails for each lesson are provided to make the concepts easy to recall. 4. Draw inspiration from the best athletes in nature, the animals. Enjoy your time with us. Your lesson comes in the form of a PDF download, or video analysis.